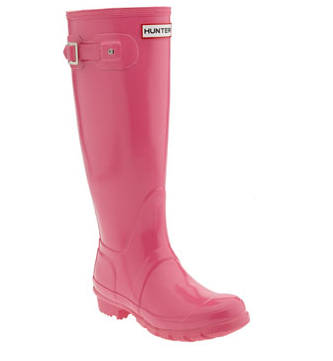 We all know April showers bring May flowers so I figure I would start with a pair of Hunter rain boots. Since I’m writing for Miss Metropolitan Junkie, it makes sense to represent this New York City addiction blog with a pair of boots suitable for New York’s rainy season. Saturday nights are all about stilettos, but when you’re ½ hour late to a Monday morning board meeting and it’s raining cats and dogs, you can safely maneuver without a fumble in a pair of this classic style boot. Of course, my stilettos are neatly packed away in my Tumi Tag. Stilettos are like an American Express Card – never leave home without it! It doesn’t matter if you and your sister don’t bake cupcakes in Georgetown (Katherine Kallinis and Sophie LaMontagne of Georgetown Cupcakes are known for wearing pink Hunter rain boots on their TLC reality show), you’ll be NYC styling in a pair of pink Hunter rain boots. How sweet is that? !